We carry Winn, Golf Pride and Lamkin brands and of course we can custom order your favorite brand. We can order any brand that you prefer. Did you know that avid players should re-grip their clubs once a season? A new set of grips is the fastest, most inexpensive way to bring a noticeable change to your game. Grips are made of materials that age and wear as a function of time. Ozone, heat, dirt, and oils from your hands age your grips and speed up the natural degradation of the grip. The traction that a fresh grip provides lets you the club lightly without the subconscious fear of losing the club during your swing. This relaxed state promotes proper swing mechanics and wrist action, while a worn grip causes you to grasp the club tighter, causing arm and wrist tension that inhibits proper swing mechanics. We offer a wide selection of standard and specialty grips to fit any golfer’s needs. 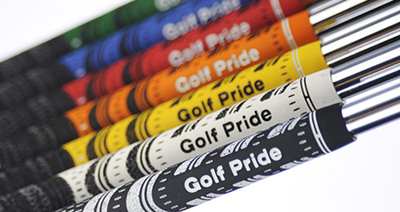 Our experienced golf professionals can advise you on the best grips for you. We’ll replace your grips within 24 hours, or in some cases, while you wait. Feel free to bring your clubs to the shop for a grip review and replacement.